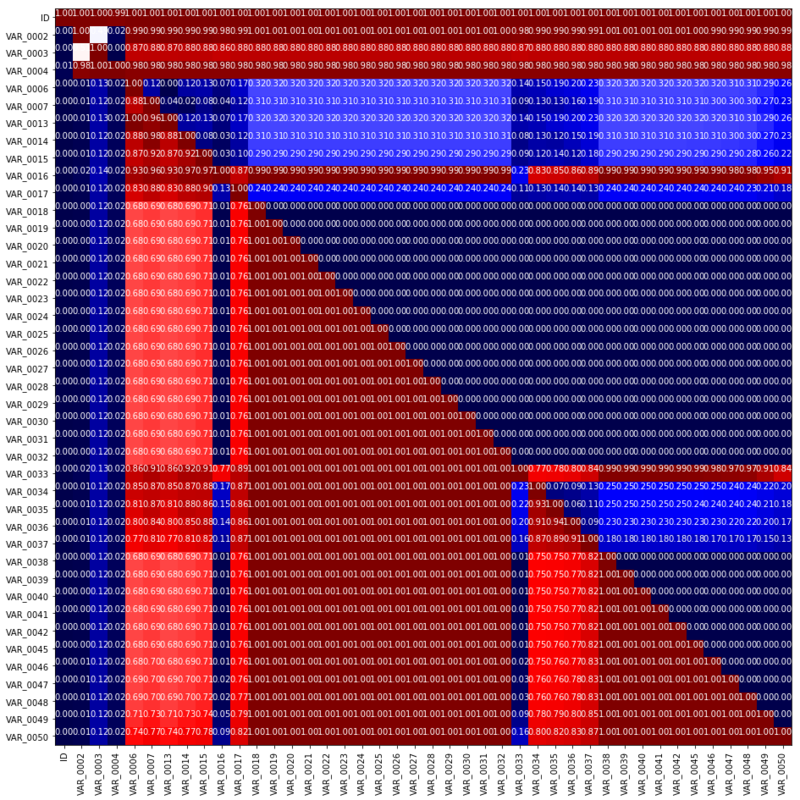 Probably the first thing you check is the shapes of the train and test matrices and look inside them. There are almost 2000 anonymized variables! It’s clear, some of them are categorical, some look like numeric. Some numeric feateures are integer typed, so probably they are event conters or dates. And others are of float type, but from the first few rows they look like integer-typed too, since fractional part is zero, but pandas treats them as float since there are NaN values in that features. From the first glance we see train has one more column target which we should not forget to drop before fitting a classifier. We also see ID column is shared between train and test, which sometimes can be succesfully used to improve the score. It is also useful to know if there are any NaNs in the data. You should pay attention to columns with NaNs and the number of NaNs for each row can serve as a nice feature later. Just by reviewing the head of the lists we immediately see the patterns, exactly 56 NaNs for a set of variables, and 24 NaNs for objects. All 1932 columns are anonimized which makes us to deduce the meaning of the features ourselves. We will now try to clean the dataset. It is usually convenient to concatenate train and test into one dataframe and do all feature engineering using it. First we schould look for a constant features, such features do not provide any information and only make our dataset larger. We found 5 constant features. Let’s remove them. Fill NaNs with something we can find later if needed. Now let’s encode each feature, as we discussed. The resulting data frame is very very large, so we cannot just transpose it and use .duplicated. That is why we will use a simple loop. Don’t forget to save them, as it takes long time to find these. Let’s examine the number of unique values. The values are not float, they are integer, so these features are likely to be even counts. Let’s look at another pack of features. These look like counts too. First thing to notice is the 23th line: 99999.., -99999 values look like NaNs so we should probably built a related feature. Second: the columns are sometimes placed next to each other, so the columns are probably grouped together and we can disentangle that. Our conclusion: there are no floating point variables, there are some counts variables, which we will treat as numeric. And finally, let’s pick one variable (in this case ‘VAR_0015’) from the third group of features. Let’s replace NaNs with something first. Let’s calculate how many times one feature is greater than the other and create cross tabel out of it. Indeed, we see interesting patterns here. There are blocks of geatures where one is strictly greater than the other. So we can hypothesize, that each column correspondes to cumulative counts, e.g. feature number one is counts in first month, second – total count number in first two month and so on. So we immediately understand what features we should generate to make tree-based models more efficient: the differences between consecutive values. We see there is something special about 12, 24 and so on, sowe can create another feature x mod 12. Let’s take a look at categorical features we have. VAR_0200, VAR_0237, VAR_0274 look like some georgraphical data thus one could generate geography related features, we will talk later in the course. There are some features, that are hard to identify, but look, there a date columns VAR_0073 – VAR_0179, VAR_0204, VAR_0217. 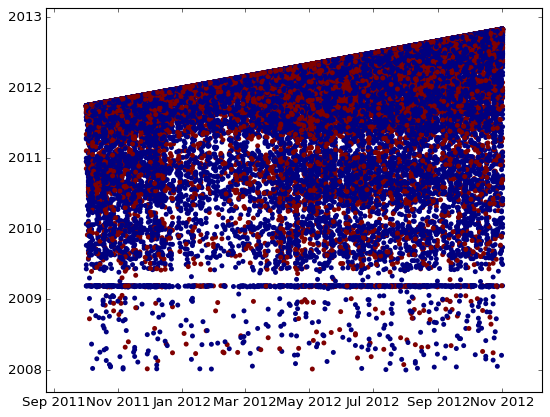 It is useful to plot one date against another to find relationships. We see that one date is strictly greater than the other, so the difference between them can be a good feature. Also look at horizontal line there – it also looks like NaN, so I would rather create a new binary feature which will serve as an idicator that our time feature is NaN.